Complete review of Goldbet and ratings given to Goldbet, including sportsbook information, contact, payments, betting, bonuses and promotions. Find here pro and cons about one of the best online bookmakers and get your 20€ cashback welcome bonus. GoldBet is an online bookmaker established in 2000 by the 365 Media Group, licensed in Austria and regulated by the European Union. GoldBet offers some of the best odds in the online sports betting industry, often 20% higher than that of their competitors. The software is straight forward and easy to navigate, offering well over 20,000 bet types on a plethora of sporting events and other betting venues. Due to US legislation preventing credit card companies from collecting payments for wagers made by US residents, GoldBet has determined to suspend all real-money gaming business in the United States. 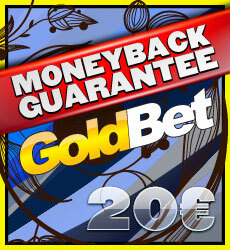 GoldBet is offering to all SportsLive users a guaranteed money back of 100% (up to €20) the stake on your first bet. To join the promotion enter www.goldbet.com, fill the registration form and type “BAS20” in the bonus code field. American Football, Baseball, Basketball, Boxing, Cycling, Formula 1, Futsal, Golf, Handball, Horse Racing, Ice Hockey, Martial Arts, Motorcycling, Sailing, Snooker, Soccer, Table Tennis, Tennis, UFC, Volleyball, Water Sports and Winter Sports. Register a new account with GoldBet ! !